Helga Deasy, dance artist and choreographer, will embrace new possibilities for dance within the space, the community of artists and with the wider public. In her second year-long residency at Uillinn, Helga continues her investigation of Laban’s principles and concepts as choreographic and creative tools in both professional and community dance contexts. Helga will deliver an extensive community-based programme including weekly sessions on Monday evenings in Dynamic release-based Contemporary Dance, drawing from her background in Vinyasa Flow Yoga and Choreological Studies, Helga’s class focuses on finding clarity and presence in movement, followed by Creative Dance for all levels, taking inspiration from poetry, the senses, music and imagery to create new dance choreography. Helga will invite participants of this class to take part in a cross-disciplinary collaboration with cellist and visual artist Tess Leak to create Up to the Elbow, a dance performance piece with a cross-generational community cast to be presented in summer this year. Also part of the residency is an exciting Dance Platform Programme, where Helga invites other performers to share her stage at Uillinn and showcase their new dance performances. The programme will begin in July with Sara Hernandez presenting her duet, Samaskara, exploring the lasting marks left by our experiences. In October, as part of the Uillinn Dance Season Programme, choreographer Luke Murphy examines huge progress made in science and medicine in The Dust We Raise, and dance artist Mary Wycherley navigates the conceptual and historical frame of the gallery environment through the lens of dance in Re-framing. 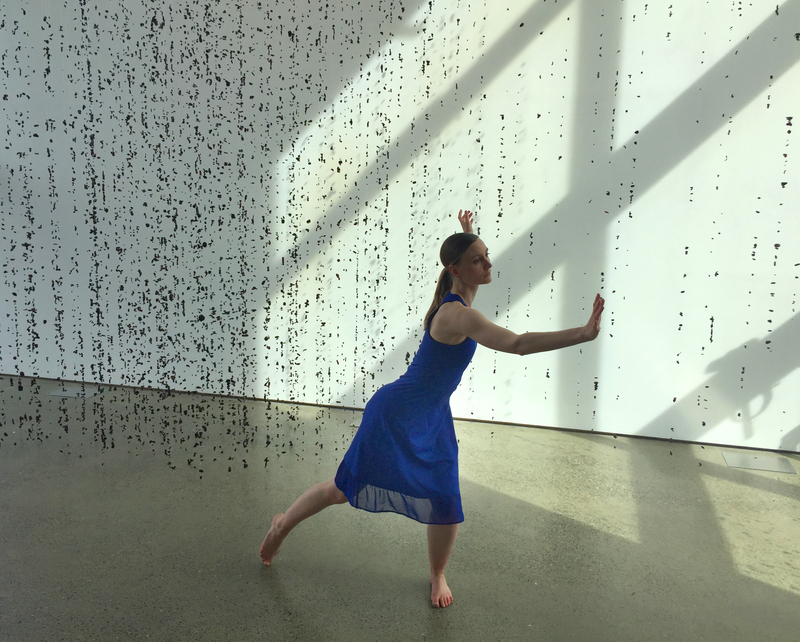 During her two days of studio practice each week, Helga will investigate concepts of space harmony as a choreographic tool to develop a distinct and clearly structured movement vocabulary. This research will inform the extended new dance ensemble work, Helica to be premiered at Uillinn on Friday 26 October 2018. Helga was selected to present her work ‘Helica‘ at ECOPOETIC, the perfomance showcase at the Laban/Bartenieff Institute of Movement Studies 40th anniversary celebration and conference. For further information please see here. Originally from Germany, Helga Deasy is a dance artist, choreographer and dance teacher based in Cork. She holds an MA in Creative Practice with distinction from Trinity Laban, Conservatoire of Music and Dance, London. Her artistic practice spans solo and ensemble work, cross-disciplinary collaborations including theatre, visual art and music as well as working in a range of community contexts. Helga has performed and presented work nationally and internationally, including Dance Umbrella Festival (UK), Theater and der Universität Regensburg (Germany), Dublin Dance Festival, Cork Midsummer Festival, The Firkin Crane and Cork Opera House. Metamurmuration performance, image by Nathan Somers. Up to The Elbow. Helga Deasy. 05.05.2018. Photo by Zenda Williams.